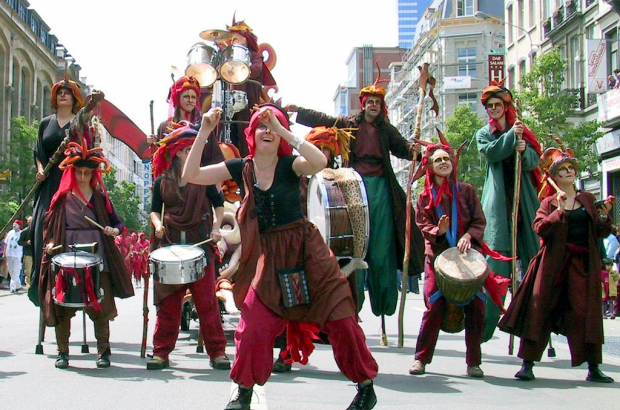 Created for Brussels European Capital of Culture in 2000, the Zinneke Parade has become a mainstay of the city's cultural landscape. Every two years, two dozen groups - called zinnodes - rally around a theme (this year's is Illegal) and create an unforgettable, entrancing, striking and magical spectacle that combines elements of Belgium's very rich and ancient carnival folklore with a contemporary multicultural twist. Spectators love to watch - but what does it take to put it on? Behind the 2,000 people parading in the zinnodes there are another 1,000 without whom there would be no parade. First of all, there are the creative facilitators from the worlds of theatre, dance, design and music who work with the members of each zinnode to create a story based on the year’s theme. That story is told to the audience through acting, dance, costumes and elaborate make-up. The costumes must be designed and made, necessitating costume designers and seamstresses. The Etterbeek zinnode consists of 80 dancers, musicians and float operators and there are 20 seamstresses busy for weeks taking the designs and making them reality. Beyond that there are make-up artists and musical instrument makers, accessories makers, float and machine constructors who will not only design and construct the floats (again with the input of the members) but also manoeuvre and control them during the parade. How does the parade grow out of the inspirations of thousands of participants without falling into chaos? That’s the job of the two Zinneke-wide artistic coordinators. One of them, Charlotte Marembert, explains: "Our mission is to preserve the coherence of the parade, the aesthetic qualities, the meaning. "We start with much discussion, everyone proposing ideas on how their zinnode will interpret the theme, what story will they tell, what sort of dancing, what sort of music, what look should the costumes and make-up create, what form will the float take. The central Zinneke team consists of between 15 and 20 people. As well as the two artistic coordinators there is a director, a finance officer and four project followers who each follow four to five zinnodes and are responsible for logistics and administration - finances, transport, and fundraising. There is also a communications team and a technical team which coordinates the metal and woodwork studios and the extensive warehouse of all sorts of recycled materials to be used in the making of almost everything. Finally there is a section that manages the circuit and the communications with the police department. Who participates? "Whoever wants to participate in Zinneke can participate in Zinneke," says Marembert. "The participants are of all ages, all ethnicities, all conditions and all walks of life. They can be individuals, groups, schools, non-profits, people with a disability or illness, prisoners, art associations, boroughs or any combination. The idea of Zinneke is to allow people who might never meet to come together in an artistic project." Among those participating in the Etterbeek zinnode, for example, Maria Gomez's day job is a costume designer, Alexis is a webmaster, Emily is a translator, Amber is a teacher, Mayliss works in the charity sector, Laurent is an account manager, Sebastien is a gardener at the Royal Greenhouses, Elena is a dance teacher and Charlotte is a textile designer. How is the parade financed? Financing comes from a multitude of places both for Zinneke itself and for the individual zinnodes, including the Brussels Region, the Wallonia-Brussels Federation, the Flemish Government, the municipalities and the CPAS. And there are in-kind exchanges, for instance, the Zinneke trains job seekers in the metal workshop and then subsidises those workers as they work for the individual zinnodes creating the parade floats. Those jobseekers will then be helped to integrate into the general workforce. Who decides on the theme? A very diverse jury of around a dozen is formed. The jury members include someone from the cultural world, a young person, a member of the Zinneke team, an artist and so on. They are provided with specifications such as that the theme must be wide enough to incorporate different meanings, must be easily comprehensible and must work in both Dutch and French. Each member of the jury arrives to the deliberation session with three choices which are all put on the table and out of this comes a final five. This is done behind closed doors and no one outside the jury knows the choices until the day of the previous parade. Five propositions are made public and anyone - both Zinneke participants and the general public - can vote during the parade at ballot boxes and for one month online. Then the theme is announced for the next parade and around 14 months before the date of the next parade the work begins. The actual circuit that the parade follows is decided on by the Zinneke team in consultation with artists.